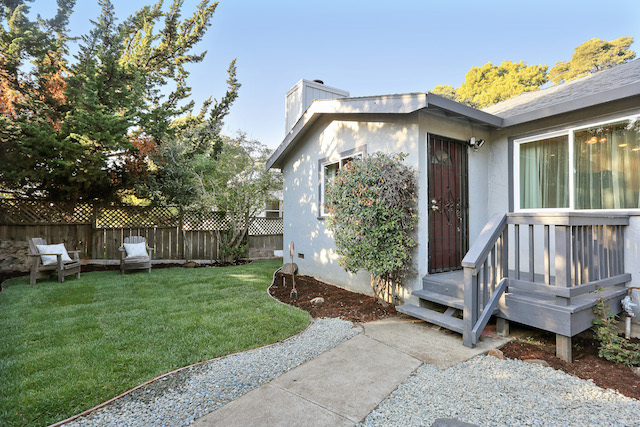 Located in the quiet and scenic Millsmont neighborhood of Oakland, 6308 Hillmont is a 1,659 square foot split level home located on a spacious 5,671 square foot corner lot with 3 bedrooms and 2.5 bathrooms. Enclosed within a wooded and ivy covered fence, the grounds are secluded and surround the entire home. The house offers ample sunlight, cathedral ceilings and a recently remodeled kitchen. Freshly painted with blond laminate-wood floors and newly carpeted bedrooms. Crown molding, decorative baseboards and recessed lighting runs throughout the home.